Take a peek at our gallery of sleek, professional templates. Whether it’s newsletters, announcements, or promotions, we’re confident that you’ll meet your perfect match. They’re all incredibly versatile, easy to customize, and look great on mobile! Make sure your email arrives with a unique, personal touch. Direct Mail lets you address each individual recipient with their first and last name, company name, and up to 15 other fields. You can also tailor custom content using powerful conditional logic and sections. Don’t worry about having to find a designer or figure out an image editing app. Direct Mail makes it easy to perform a variety of common operations, like removing backgrounds, cropping photos, or adding filters. Your images will look their very best. Behind the scenes, Direct Mail goes to work performing special tricks (like CSS inlining, plain-text generation, and image optimization) to make your email look great in every popular email client. Want proof? Use our handy Design Test feature to see pixel-perfect screenshots of your message rendered in over 50+ email clients. You’ll sleep better knowing your latest and greatest design looks as good in Outlook as it does in Gmail. Live previews update as you type, showing you exactly what each of your recipients will see (including custom content). Click a button and up pops a preview of your design on iPhone or iPad. Our feelings won’t be hurt if you’d rather use someone else’s template. In fact, we make it easy by allowing you to use templates from Apple Mail, Mail Designer, Mailchimp, Campaign Monitor or any other document or web page. Say so long to slow, clumsy image uploads. With Direct Mail, copy or drag images from any app and drop them right in to your newsletter. We’ll make sure they look great—including on retina displays! Go beyond the same old, boring email fonts. Direct Mail includes a professionally-curated selection of fonts that will make your email stand out in the crowd. Our new templates are 1000% more flexible than before! Add, remove, and rearrange text, image, videos, buttons, and more. Customize what your recipients see even before they open the email, and choose how your campaign will look when it’s shared on social media! Grow your mailing list by adding a subscribe form to your website that automatically syncs with Direct Mail. Customizable colors, logos, and form fields let you match your brand’s look and personality. Includes one-click integration with your company’s Facebook Page. Direct Mail can swiftly import all of your contacts from apps including Contacts, Daylite, Google Sheets, Outlook, FileMaker Pro and more. 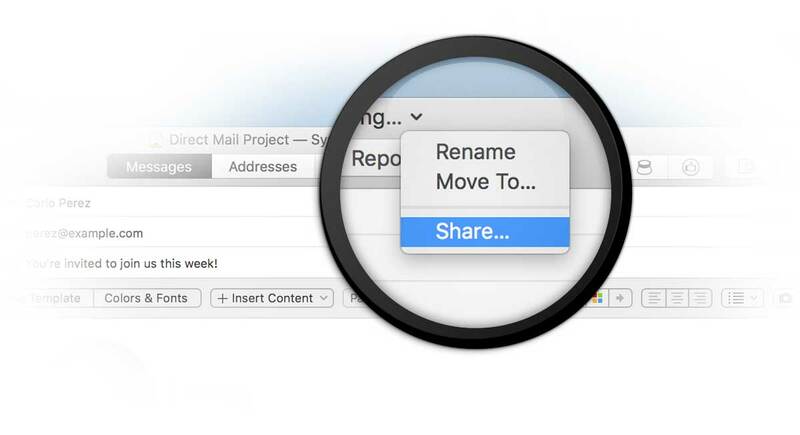 Importing from CSV files or even MySQL databases is a snap! No app is an island. Our integrations with Zapier and PieSync let you connect Direct Mail to over 1,000 popular apps and web services, including Slack, Salesforce, Shopify, and more! Watch as contacts from your web store or customer relationship software are added automatically to your mailing list without you having to lift a finger. Strategically target specific readers by manually segmenting your list into different groups. Or, use Smart Groups to automatically segment your list based on rules you specify. Choose from over 30 different criteria (geo-location or subscribe date, for example). Get personal with your readers by assigning custom fields for everyone in your list. In addition to the standard first name, last name and company name, Direct Mail can store up to 15 other custom attributes for each recipient, like age, favorite color, physical address and a customer ID, to name a few. With Direct Mail you no longer have to worry about managing your unsubscribe requests. Once a recipient has unsubscribed, they’ll simply be crossed off your list. Oh, we also take care of all of your bounces and spam complaints, too. Our dashboard gives you clear summary of key campaign metrics, including opens, clicks, bounces, and unsubscribes. See what the most popular links are, as well as top email clients and geographic locations. Direct Mail generates activity reports for each individual subscriber. Drill down into the details to see how your readers interact with your email campaigns, including what links they click or when they open each campaign. Send your campaign and go! With Stamps, you can view your tracking reports on your iPhone and iPad. Opens, unsubscribes, charts, clicked links, bounces—all of the smart goodies that keep you in the know when it comes to your email campaigns—and at no extra cost. Need to share the results of a campaign with a boss, client, or coworker? We’ve got you covered. Direct Mail can share your campaign dashboard via a spreadsheet, PDF, or live-updating website. Compare up to ten campaigns side–by–side to see which ones are landing with the greatest impact. Find out what (or when) works best. We also have beautiful charting, in case you’re into that. Email bounces and spam complaints can negatively affect your email reputation. With Direct Mail, you'll get detailed reporting on bounces and complaints, and we'll take care of unsubscribing them for you to prevent problems down the line. Click Send and watch results come in immediately as your readers open and engage with your email. Updates are pushed right to your screen without clicking refresh. One-click integration with Google Analytics lets you link user activity on your website back to the email campaigns that brought them there. For a white-label experience, Direct Mail can use your own domain name for any open- and click-tracking URLs that are inserted into your email. Take advantage of our e3 Delivery Service, designed to save you time and headache. Large lists send in a matter of seconds, and we work with email providers around the globe to help your email make it to the inbox. We take care of handling bounces and deliverability issues, too. Direct Mail makes it easy for your subscribers to forward, share, or tweet your emails (if you want) by automatically creating a web version of your message. You can even customize how your campaign will be displayed in social media news feeds. Direct Mail alerts you to broken or unaccessible links, spam filter issues, misspelled email addresses, and all manner of other mistakes that might be lurking in your message—before you send it to 10,000 of your closest friends. We make it easy to schedule emails to go out whenever you wish. Got a timely promotion? Just create the message now and set your email to send automatically when the time is right. If you already have your own company mail server, we’re good with that, too. Direct Mail can send via your own SMTP server, and can be tuned to respect sending quotas. It’s your email, not ours. That’s why Direct Mail gives you the option of removing ads or co-branding from your emails. Keep your design the way you intended it! Don’t worry about getting bounced due to authentication problems. Direct Mail supports all of the latest technologies, including SPF, Sender ID, DKIM, DMARC, and SMTP over TLS. Work on your campaigns from any device, and with any colleague, whether you’re in the same room or across the globe. Simple, reliable cloud sync features work in the background to keep everyone up-to-date in real time. Fine–grained permission control lets you decide who gets full access to edit (and send) your projects, and who gets to just take a look. Collaborators who don’t already use Direct Mail can sign up for a free account to work on your project. The cloud means never having to worry about backing up your campaigns again. Your work is stored safely in the Direct Mail cloud and is easily accessible at any time from any device (even offline). Create as many projects as you want. Direct Mail keeps working at full speed even when an Internet connection is unavailable, and syncing resumes automatically once the network is available again. Tell Direct Mail when to send an email on your behalf, automatically, using autoresponders! For example, you can trigger an email when someone joins your mailing list. Autoresponders are highly customizable, easy to use, and come with the same great reporting features you already know and love. Let your subscribers know they’re important to you by sending them a celebratory wish, or a special promotion, every year on their birthday. Create a weekly email training course to nurture leads or generate interest in your business. Send reminders about upcoming appointments to your customers. Send targeted follow-ups to subscribers that open or click specific links in your email campaigns. Use our API to build powerful integrations between your systems and Direct Mail. Synchronize customer lists, add a newsletter signup to your e–commerce checkout flow, programmatically generate campaign content, and more. Learn more. Not a programmer? No problem. Use Zapier or PieSync to connect Direct Mail to the other web apps and services you already use. Don’t limit yourself to just what runs in a web browser. Direct Mail takes advantage of powerful technologies built in to macOS, allowing you to work faster and smarter than the competition.